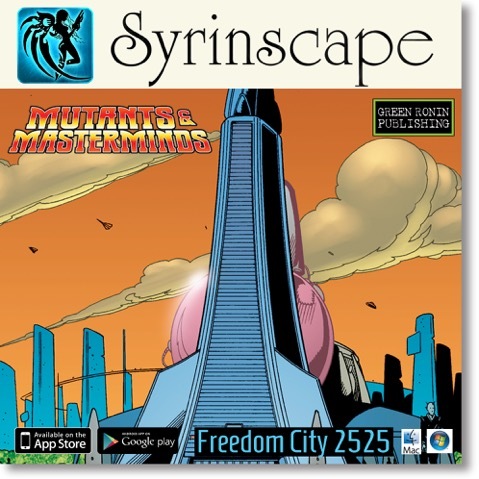 Today we are pleased to announce, in conjunction with Syrinscape, two custom superhero SoundSets for Mutants & Masterminds, Space Fight and Freedom City 2525. These SoundSets feature music and sound effects tailored to Mutants & Masterminds play. With the whoosh of passing hover cards, the whine of passing emergency vehicle sirens, the beeps and buzzes of droids, and so much more, the Freedom City 2525 SoundSet from Syrinscape brings everything needed for players to immerse themselves in this high-tech utopian metropolis. The Space Flight SoundSet features everything needed for epic superhero space battles, including laser guns, freeze rays, humming electro force fields, whooshes, and whizzes and a soundtrack befitting the best pulp movie. Read the press release for more details, or just head straight to http://syrinscape.com/! SYDNEY, AUSTRALIA (May 25, 2016) – Syrinscape, creator of the award-winning apps that put the power of custom, movie-like sound effects, soundscapes, and music at the fingertips of the gamer, and Green Ronin Publishing, award-winning publisher of innovative and acclaimed games such as Fantasy AGE, Dragon Age, A Song of Ice and Fire Roleplaying, and more, announce today the companies have partnered to develop custom Mutants & Masterminds SoundSets for the Syrinscape Sci-Fi app. The first two Mutants & Masterminds SoundSets launch today, Freedom City 2525 and Space Flight, with monthly releases thereafter, each featuring a new location and encounter from the popular roleplaying game, and are playable on PCs, Macs, Android phones and tablets, iPads, and iPhones. 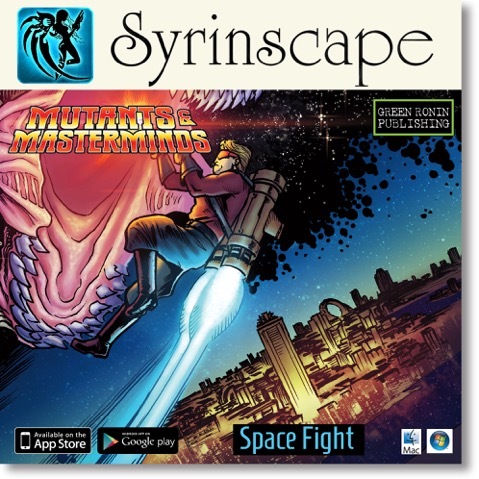 Mutants & Masterminds SoundSets join the ever-growing Syrinscape Sci-Fi library of fantastic sounds for any sci-fi tabletop adventure, and are available from Syrinscape ($3.99/ea), or as part of the Syrinscape Sci-Fi ongoing subscription for $6.50/month. The award-winning Syrinscape apps for Sci-Fi, Fantasy, and Board Games bring fantastic, realistic sound to tabletop gaming. Each is available to try for free, can be completely unlocked for free for 30 days at Syrinscape.com/freetrial, and includes 2 free SoundSets to keep after the trial. Since 2002, Mutants & Masterminds has earned its title as the World’s Greatest Superhero RPG, inspiring countless game sessions and winning many awards for excellence. Its detailed character creation system lets you create the hero you want to play, choosing from a wide range of skills, advantages, and powers. The streamlined system of game play requires only a single die roll and features easy to use rules. Now in its Third Edition, Mutants & Masterminds is supported by a robust line of sourcebooks, including Emerald City and The Cosmic Handbook, and provides for the rules engine for Green Ronin’s companion game, DC Adventures. Using a powerful audio engine and complex algorithms to produce ever-changing soundscapes and rich encounter-specific music, Syrinscape conjures every aural landscape imaginable, from ethereal forests and stony shorelines, to dank, vermin-filled dungeons, to the spooky depths of the underdark. Designed by accomplished composer and tabletop gamer Benjamin Loomes, along with the developers at the Interaction Consortium, Syrinscape builds on more than 8 years of prototyping and community feedback. Syrinscape is based in Australia. Syrinscape is available for a wide range of devices, including PCs, Macs, Android Tablets and phones, iPhones and iPads, and the players can be downloaded via syrinscape.com for free. Two New M&M PDFs: Antarctica and Apocalypsette Green Ronin Gamer Badges!